I woke up this morning craving something mexican food inspired and decided on a scramble! I had brown rice left over from last night and knew that would be perfect in a bowl! I’m all for including non-breakfast foods into breakfast meals and rolling with the punches! 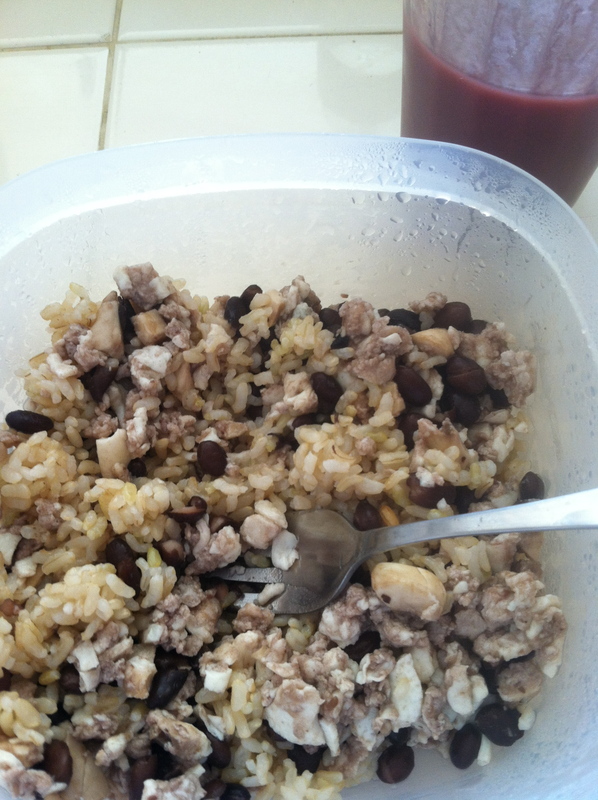 Todays scramble included left over brown rice, black beans, mushrooms and egg whites. Yep, I know I have nothing of the Mexican food category in this scramble I was going to add salsa but whatdya know we were out. Sad face. Salsa always seems to be in the refrigerator when I don’t need it but when I want it in my breakfast it is suddenly gone! A glass of Naked Blue Machine rounded out the meal! I don’t know why I seem to make meals that look so unappetizing in photos but again, I promise you it was delicious! Now lets talk motivation! I’ve shared a little bit about my motivation for wanting to run a half marathon! Besides being one of the items on my bucket list I’m also doing it to keep myself focused and to have something to look forward to finishing and, of course, having the feeling of training for so long and accomplishing such a huge goal by crossing the finish line. I’ve shared on my blog that something in my personal life happened that it pushing me to do this, mainly for the focus. I believe in being honest and open on here and I’ve been debating about sharing but I believe I should, sooo here goes! A friendship, relationship what ever you want to call it recently ended for me. Usually friendships ending while yes sad, don’t get me down as much as this one did. I’m not going to lie and say I am not incredibly hurt and upset. He, yes a male, was one my closest friends, we just about shared everything with each other and nothing made me more happy than hanging out with him. I’m scared to admit this on here because I know some people who are familiar with the situation might read this, but I loved this guy. It ending was completely devastating to me and I’m trying to pick up pieces and move on. Which brings me to staying focused, training for this marathon and writing this blog along with my crazy busy work schedule has helped me to not focus on what happened and what could have been but just to focus and be in the moment. Sorry for such a sap of a blog post but I just felt like I needed to share that piece of information with y’all! I’ll be back around lunch. See ya on the flip side! Question of the morning: Have you ever had something happen personally that motivated you to do something?